1) How hard a job is it to change this? Any special tools needed other than normal well stocked tool box? 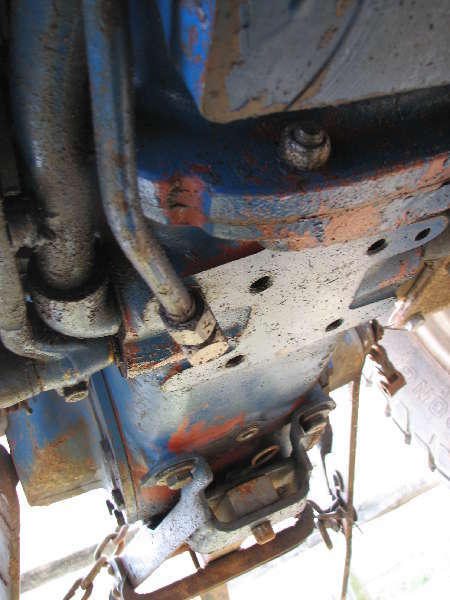 2) is the front axle fluid divorced from the rest so that either heavier gear oil or cornhead grease could go in? Obviously not an option if it is part of the system. 3. If I did take this back to the dealer, ballpark what could I expect it would cost? I am doing a bit of guerssing here so I may be on the wrong trail. My guess is you have a front wheel assist tractor with planetary hubs that the front wheels bolt to. If I'm guessing correctly the hub is leaking where the shaft from the "U" joint goes into inside of the hub. Those hubs are pretty universal and likely manufactured by the same company for several tractor brands. I've had that type hub leak on bigger John Deere tractors, but didn't repair it myself, I've saw tham apart but wouldn't tackle it without a tech manual, I think there are some shims that have to be in the right place when it goes back together. I don't know what lubracant NH recommends but I'm thinking it would be the same as your transmission fluid. I don't think corn head grease whould be good, it has to warm up quite a bit before it becomes fluid. We gave a mechanic in the neighborhood who has used corn head grease in common tapered bearing wheel wagon hubs for years, says that's the only way to go for them.